Produced by the titans of infused cigars for Rocky Patel Premium Cigars, Java Mint by Drew Estate is a very flavorful chocolate mint cigar that pairs well with your morning coffee or as the perfect after-dinner mint. Handmade and box-pressed, the medium-bodied Java Mint's special blend of Nicaraguan long-filler and binder tobaccos are enveloped in a naturally sweet Brazilian Mata Fina maduro wrapper aged 3 years. 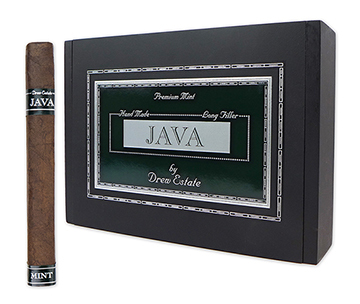 Infused with cocoa, select mints, and vanilla, Java Mint cigars are rich, creamy, and smooth with just the right balance of natural tobacco taste and infused flavors for which Drew Estate is known.